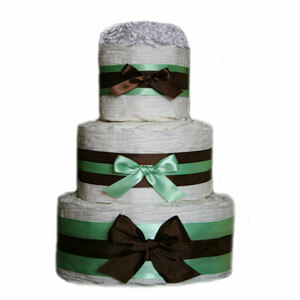 An extravagant creation, this Organic 3 Tier Diaper Cake will surely draw tons of attention. Decorated with high end silk ribbon in neutral colors, and glazed with organic whip cream, its hard to believe this diaper cake is not edible. Surprise a new mom when visiting the new baby in the hospital, send as a corporate baby gift to an expecting parent or decorate a baby shower using this one of a kind centerpiece, it will be the most memorable gift one can receive. Exclusive to GrowInStyle, this Upscale Diaper Cake is baked with approximately 45-50 Nature BabyCare Eco Friendly Diapers Size 1. To upgrade this cake, please select the option "Upgrade Diaper Cake" below.